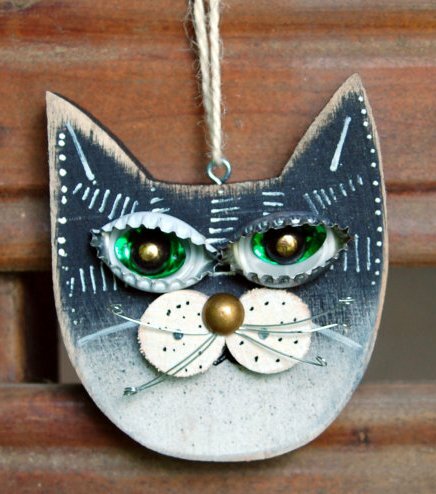 On my ongoing search for unique and fun cat themed items for my website, I recently discovered these delightful, eco-friendly cat ornaments. And I love that they are designed and created by an artist following her dream. Jeanne Stern is an artist living in north Georgia. She specializes in folk and decorative art, inspired by the plants and animals she observes in the woods, lakes, rivers and farmland near her residence. I, of course, immediately focused on her wonderful cat designs. Each one is handcrafted from reclaimed wood and recycled components, helping to save our landfills. They are a substantial size at 3 1/2″ x 4″ x 5/8″ with a cotton cord for hanging. Although they are called “ornaments” they are perfect for any decorative idea. 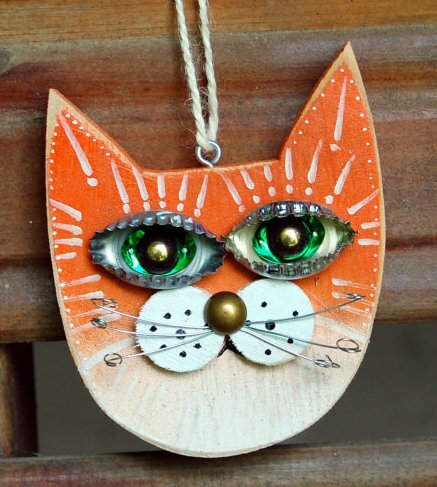 Hang on a hook in any room for a touch of whimsy, hang near your cat’s bed or feeding area or on a door knob into the cat’s area. Another idea is to add it to a gift basket or on a present for a cat lover. It will make a great keepsake! These ornaments will be available in 4 colors: Black, Grey, Orange and Yellow. Remember, being handcrafted, each one will be slightly different with its own personality. What a unique gift to give to a cat lover! You’ll want to stock up for birthdays, holidays and “just because” days. Arriving soon at Georgia’s Gifts! If you are interested in another color, please let me know and a custom order can be done. Let me know what you love about these new cat ornaments. Do You Remember Orangey The Cat? A few nights ago I watched the 1957 movie The Incredible Shrinking Man which is one of my old-time favorites. If you have not seen it, there is a scene where the shrinking man is small enough to live in a doll house. This works out okay until his cat gets left inside the large house with everyone else out for the evening. I think you can guess what happens next. (Don’t worry, after a great “cat & mouse” battle the man gets away). I started wondering about the cat in the movie and decided to do some research. Turns out this orange tabby is an award-winning feline actor! He is the only double-winner of the Patsy Award, the animal kingdom’s equivalent of the Oscar. (PATSY stands for Picture Animal Top Star of the Year). Orangey won his first award for his debut in the 1951 movie Rhubard, playing a baseball team-owning cat. Movie poster for Rhubarb featuring Orangey the Cat. Orangey won his second Patsy ten years later playing “Cat” in Breakfast at Tiffany’s. His role was a homeless feline who visits Holly Golightly (played by Audrey Hepburn). Here is a great You Tube video by Alex DeCosta showing all the clips from the movie that feature Orangey the Cat. It might be hard to believe but I had not seen this movie so the ending clips with “Cat” and Holly in the rain brought on some tears. Scene from Breakfast at Tiffany’s with Orangey. Orangey was trained by the famous animal trainer Frank Inn, known for many famous critter actors including Arnold the Pig on Green Acres and Higgins the Dog on Petticoat Junction. As a single cat can only master a few tricks, Frank trained a crew of look-alikes to work as a group under the Orangey name. This is a common procedure for cat actors. In his 15 year career Orangey the Cat also appeared in Gigot, Village of the Giants and had a recurring role as “Minerva the Cat” in the TV series, Our Miss Brooks. You’ll now find Orangey properly memorialized at Forest Lawn Memorial Park in Hollywood Hills with other successful actors. Next time I see Orangey in a movie I’ll definitely pay more attention to this veteran actor! Which is your favorite role by Orangey the Cat? We’d love to hear your comments. The Absolute Cuteness of A Sleeping Cat! Once in a while I like to just sit and watch my cat. Sometimes she is so busy- a face bath takes a while, and that tail needs to be smoothed down, and those freshly trimmed claws need some attention to make sure they feel right. Then she has to just sit and ponder her world for a bit. If only we could have a glimpse into a cat’s mind to see what they are thinking! Then after all that, it’s definitely time for a nap. And the cat is the supreme napper! Of course some might believe babies or puppies top the list, but for me the cat will win every time. When the whole house is a bed, how do they decide where to curl up or stretch out? I know after a nice lunch that sunny room is a preferred spot. I’ve seen my cats move with the sun! Or when a load of freshly dried laundry is so warm and inviting to a cat, how can I refuse letting her get a toasty snooze? Another thing to enjoy is the many positions a cat will get in when in a deep, sound sleep. I like the back curl, it looks like the cat is in pure ecstasy. Below are a few favorites. I’m sure you also have a lot of favorite views of your sleeping kitty. Tell us about them! Last week was the LA Gift Show for wholesale buyers. Although the show is really getting smaller and smaller each year (the Las Vegas show is gaining ground), I still like to go to search for something new for my website. Plus, since I have been going there or working there for about 10 years, I know a lot of people and welcome the chance to visit with them. Back to my search- I’m always on the lookout for new or unusual cat items, or products that you can’t find everywhere. That’s really hard these days with all the cat web sites and major store chains around, but I get lucky sometimes. The last find I had was the “Squaredy Cats”- Square shaped cats with a message. (Check them out on my site). One find- some adorable cat kitchen items such as guest tea towels, spoon rests and mugs. The clincher for me for buying this line is because they donate a portion of their proceeds to the WSPA. The line featured 4 styles of cats. I’m starting out with the ever popular tuxedo cat and a personal favorite, the orange tabby. Another find- in the craft section of the show I met an artist creating cat and dog art on jewelry, greeting cards and night lights. Since all the designs are her art, they will be a unique item to carry. I really enjoyed talking with her and hearing her story of how she got started and about her life. I’m happy to give my support to another small business woman! These were my two main finds this time, although I’m looking into a line of pillows that can be personalized and also adding some Hello Kitty to my site (another personal favorite). If you have any requests on certain products, feel free to comment or email me. I’m open to new ideas!